This blog has examined the new trend toward “micro-housing” in terms of sub-urban and rural settings in the articles Teeny, Tiny Houses in July of 2011, and Tiny Houses: Part 2 in March of 2012. The trend for small, efficiently-designed housing doesn’t look to be letting up any time soon despite a slight bounce-back of the general real estate markets. Now we are hearing more about big cities either looking into developing “micro-housing units” convenient to downtown workplaces and shopping, at reasonable prices (and rental prices) for young workers, middle income singles and couples without children, and segments of the elderly population. 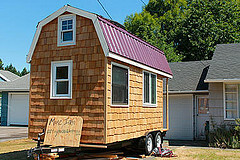 The Christian Science Monitor for September 25th asks, “Could you live in 150 square feet? Cities try out micro-housing.” They report that San Francisco, Seattle, Chicago and New York have begun trials of ever-smaller ‘efficiency’ apartments – dubbed micro-housing – in the hearts of their metro areas. For those who would eschew living as Bruce Willis’ character in the movie The Fifth Element, the very thought of living in a single room is uncomfortable. For many singles, childless couples and young people coming out of college (where they’ve lived in a dorm room for awhile), living small in the midst of the city doesn’t sound so bad. Think about it. If you work 8-10 hours a day (sometimes more), what do you really need from ‘home’ apart from some privacy, a kitchenette to store and prep the few meals that aren’t eaten out, a suitable bathroom, a TV chair, a place to do any take-home work they’ve got, and a comfy bed to sleep in? Low quality of life does not have to go hand in hand with limited living space, he says. He points to Tokyo, where the Japanese have figured out how to make every inch of living space count, he says. “It’s entirely possible to live well in 200 square feet of living space,” he says, as long as every function has been well thought out. “We are certainly not the first ones to deal with this issue,” Mr. Gendell says with a laugh. “We are blessed in this country with more living space,” he says, but many other nations have proved that it is entirely possible to live in a more concentrated living environment – one that would be better for the planet. Chicago has built thousands of downtown dorm units in high-density buildings in recent decades, for the income-challenged and homeless population. As housing prices in cities begin to rise again, these small units will become increasingly popular. Moreover, I’d be willing to suggest that as “living small” becomes a somewhat normal thing in cities, the suburban and rural movement toward tiny houses will also benefit. Even stay-at-home homesteaders tend to spend more time outside than in as we work toward our idyllic self-sufficient dreams, many of us are nearing retirement age and the children are on their own. The whole “Tread Lightly On The Earth” philosophy has merits that perhaps in coming years our city cousins can learn to appreciate as much as we do. They’ll need outdoor activities to occupy their time too, so perhaps we can expect a boom in rooftop community gardens as this micro-housing trend takes off. City homesteading can be ‘a thing’ too!